Two strangers met in church. The next day the strangers met in the supermarket. They both reached for the last packet of milk. And they both cussed at each other. In the blood that turns things white. The reason why the Pastorís never sane. And the Spirit, the 3 in one. My Creator, my Potter, my Art. Who turns away when people ask, Why? Whose blessings are real and sometimes a bluff. Beverley Nambozo Nsengiyunva is the founder of Beverley Nambozo Poetry Award and Babishai Niwe Literary Foundation which means Creating with You, in a mixture languages. 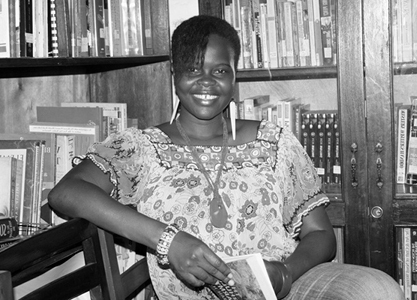 It Babishai Niwe has been coordinating annual poetry awards for Ugandan women since 2008 targeting hundreds of women country-wide over the past 5 years, being the only award o its kind in the country. In 2014, the award will extend to the entire continent, targeting both men and women. In 2013, the foundation will publish an anthology of poetry from poets of Africa. Beverley Nambozo is also the author of Unjumping, a chapbook collection of poetry which was published by erbacce-press in 2010 after she emerged a joint first runner-up in their annual poetry competition. She has a Masters Degree from Lancaster University and devotes a lot of time to being a stay-at-home mum. Beverley currently lives in Kampala and looks forward to travelling far corners of the world with her husband and children.